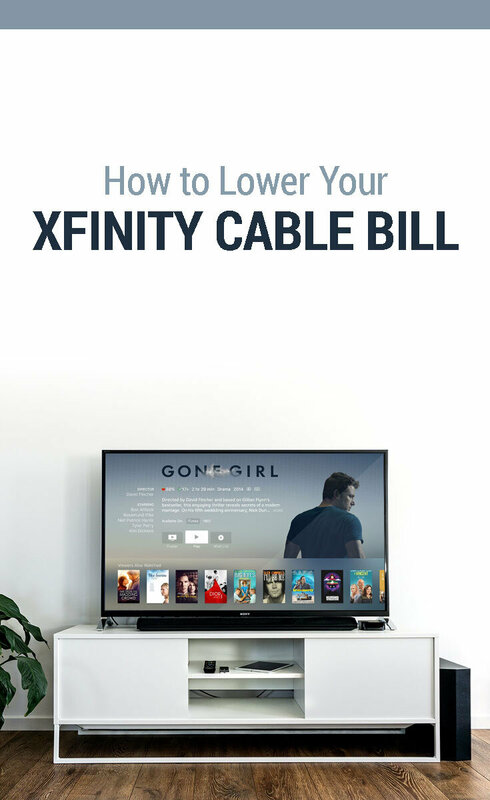 Thought we would republish this post from several years ago, as it still has good information about how to lower your cable bill with Xfinity (formerly Comcast). Hope it helps! A couple weeks ago we got a notice in the mail that our Comcast (Xfinity) cable bill was going up by about $50. Apparently they had mistakenly extended our promotional period (I don’t know how that happened) and needed to start billing us what they should have been charging us the last 6 months or so. Of course – we knew this letter (or one like it) would be arriving at our mailbox soon. It’s just a bit of a surprise when it comes. I guess what I thought was most troubling was they disguised the increase as a mistake of theirs and assured us they wouldn’t be charging us for that error (Thanks!). I’ve written before about my attempts at lowering my Comcast bill by touting our good customer status and loyalty. But, it didn’t really go as planned. Then, I happened upon a special that Financial Expert Jean Chatzky did on the Today show. She polled her readers what one thing they most would like to save money on. The answer: how to lower my cable bill. The answer didn’t surprise. Getting a good rate (and a consistent one at that) is no easy task. Comcast does offer a new service called Internet Essentials that provides reduced rates for lower income families and individuals. From when I first picked up the phone to call Xfinity, to when I hung up – the whole process took 1 hour. Be sure you have a little time carved out of your day for this phone call. Of course, I did call at the end of the year and Xfinity was likely a bit short-staffed given the holidays. Still, know this could take some time. As of this year (2019), Xfinity has changed to scheduling a phone call with a customer rep rather than calling them directly. I think they are trying to make things a bit harder to make contact. They do offer a chat feature which is nice – but you may need to get on the phone with a rep to negotiate your bill due to nuances with your bill. To contact their “Loyalty Department” directly, you’ll need to dial 1-800-XFINITY (1-800-934-6489). Monday – Saturday 7AM to 9PM EST. One of the things I did before calling Xfinity was to check around the neighborhood to see what folks where paying. In particular, I wanted to see what a competitor of Xfinity was charging folks. In this case, it was Dish (or DirectTV). My next door neighbor, was getting a package that was considerably less than what I was getting with Xfinity. You’ll need this information to make the case for lower rates. Jean Chatzky recommends that when you get on the line with a billing customer representative, that you immediately ask to be transferred to the Retention Department (sometimes referred to as the Loyalty Department OR Customer Solutions). This was my first mistake. I didn’t. I had a helpful and courteous rep who tried their best to offer me a cheaper package, only to come out with about $6 less/per month. I wasn’t happy with that and finally asked to be transferred to Retention. Ask for this department right away. I never think you have to be rude or inconsiderate to negotiate a better deal. At the same time, you don’t have to be a pushover. When you get through to the Retention Department, state the reason of your call: “I see that Dish is offering considerably lower rates than Xfinity – and would like to see if there is anything you can do to lower our bill before we decide to leave.” Of course, you could eliminate that last part “before we decide to leave” – but I’m just giving you a script that worked for me. When you get to the Retention Department, they already know you’re about to leave. The first offer the customer service representative gives you may not be to your liking. Don’t settle. Ask if there is anything further they can do. They’ll likely go through a checklist to see what services you are using. In our case, the rep asked us what channels we were using. I didn’t need to spend a lot of time negotiating. The rep gave us a deal to get us back to our original promotional pricing and included an upgrade to our landline (which we use for faxing). To give you the starter promotional prices, Xfinity does something similar to what the cell phone companies do. They “lock” you in. To get our bill back to the promotional rate, Xfinity required us to stay on for two years. They ensure this by a $150 early termination fee (which goes down by $15 every 3 months after the new rate goes into affect). I don’t really see this as a terrible catch – as we won’t need to re-negotiate on the pricing every 6 months when the promo expires. Hope this helps. You should be able to lower your Xfinity cable bill too. Please let us know how it worked! Update (1/11/13): In addition to the lower monthly rate – Xfinity also gave us a credit on our account (which amounted to a free month of service. Nice. Update (8/12/16): If you qualify, you may be able to get Xfinity at a much lower rate depending on your income. It’s called Internet Essentials and folks can get home internet starting at $9.99/month. Update (10/12/16): After a year of no-cable, our friends at Xfinity have again raised our rates for internet service AND will be limiting data usage (right now set at 1TB – which is quite a bit). We had been paying $45/mo for our high-speed internet and they raised it to $70/mo. They’ve changed a lot of their bundles now so that for $70 / $80/mo, you can get cable AND internet together. This is probably a play to get more cable subscribers. So you think, “if I’m paying $60-70 for internet – I might as well pay the extra for cable again” (this is their hope at least). After negotiating again with them to lower the rate to what they were, I cannot stress that you will need to stand firm. If you do not ask for retention right away – you will have to deal with their first line of employees who do not have much freedom to offer you any savings. Again, they count on the fact most people give up or do not like confrontation – so they will hang-up or accept the first offer given to them. You will need to speak with the loyalty dept or retention to get what you want. After speaking with retention, I was finally able to get my old price back + $5 (so, $50/mo). Not bad. Update (3/7/18): If you have been given a promotion rate and it expires, you’ll need to call back and negotiate another rate decrease. Xfinity requires you agree to their contract to receive this pricing (1-2 years) – but if you are using them, it is worth the savings. I called recently and got another $10 off my bill – back to the original promo rate after it had expired. After you’re done saving on cable, you may want to lower your cell phone bill. See how Aaron pays under $15/mo for his. I am excited to find these posts. My husband is extremely fed up with our Xfinity bill. Our bill is $238.46 each month. This is our highest bill that we pay monthly. 1 year ago I called to see if we could decrease our $180.00 bill to less by removing some movie or cable channels. I have always had packages. After the rep and I went thru what we need for service, which is 4 rooms, a land line, internet. We figured out that dividing up all the basic service you need to run the home, with internet, a land line and just basic cable, would be about the same price I was paying already. So there like, but for $10 more dollars you can have all the channels in the world plus higher speed internet! So of course I took it ha ha. Now I have netflix for an extra $10 too. The package I currently have is $199.00 + netflix $10.00+ all the taxes. I just tried to reduce it again and the offer was less cable channels, higher speed internet $5 more dollars a month, because we would be out of the package. Yikes! Good luck people! Does anyone know how to have internet and cable for less from another provider? I am out of contract in one year. Whoot Whoot thanks for your awesome post! I love saving money! I called xfinity and asked for customer service then I asked right away for the Retention dept. Told them I got my bill way too much I can’t afford it and I need to talk to them. They were able to drop me back to the same 1 yr promo rate for another year and was able to prorate my upcoming bill too. God Bless you guys! Another option is to ask for the cancellation department and threaten them to cancel your membership to go to another provider. I’ve had a $30 a month plan for years and they recently upped my plan to $70!!!!. I just called them and told them I wanted to cancel and she was able to get me back to my $30 a month plan for another 12 months. It was actually very painless and took probably 10 minutes. Usually, I’m on the phone with Comcast for hours. Nice – great to hear Corey! Thank you so much for posting this. I am typically very prepared for these calls, but my bill went up this month after my 12 month promotional rate so I just called (internet only). CS rep repeatedly told me there were no promotions, my only options were to get slower internet or check back next month. I tried looking up the promotional rates to do the “well if I cancel and come back, you would give me this, so why not now?” with no luck. I did a search for “how to save money with Xfinity” and found this post. Was reluctantly transferred to the retention department and got my bill back down to $5 BELOW what it was last month for the next 12 months when they just raised it by $25. Took about 12 minutes with CS rep, then another 12 with the retention department. $30 per month is $360 you saved me in a pinch this year. Thank you! If you ever find yourself in central Illinois, I owe you a beer. Great to hear Will! Yeah, the only downside is they typically put you on contract for a year or so (and there are early term fees if you cancel early. My only other option for internet is pretty much garbage, so an early termination fee shouldn’t ever be a problem for me. Iam 72 years old with lung cancer !Iam home all the time except for dr app.how do I reduce my bill..Please without taking all away. Hi Argie. Am sorry to hear about your condition. I’ll reach out to you via email. Hi, I just wanted to let you know that I just used your information to negotiate my bill back down to the original promo price with DVR thrown in for free and 3 months of HBO free. Thanks for the simple tips, it made the discussion less stressful and I was done with the call in 11 minutes! Excellent Kendra! Glad it worked for you. Hi Diane. You’re a loyal Comcast customer! First thing I would do is to call them, and say, “I’ve been with you for over 11 years now. Is there a loyalty discount you can give me today?” They should be able to get you something (even if it is a one-time discount). As to your bill, do you have cable and internet? If both, I would say this is somewhat reasonable. As a reference, I pay $45 for high-speed internet w/o cable. Also, you might want to look into DirecTV as you can get that (starting out) as low as $20/month. Want to save a lot of money? Just don’t have cable! When we turned off our cable, it was a huge leap of faith for us, but now that our lives have adjusted to it, we don’t know how we had time to watch it in the first place. Also, our children aren’t influenced by the advertisements for toys and junk food (more savings!). It’s been awesome. Even better Katherine – just don’t have it! I commend you for it. Thanks for your suggestions – they worked for me! I’ve been a customer with Comcast since 1998. Two years ago I got an HDTV, so I called Comcast to see what my options were for getting HD service. The offered me a package (HD Premier XF) for $160/month for one year, increasing to $180/month for the 2nd year, then going up to the regular price of $205/month after that. Being that my first two years are up, the bill that arrived the other day reflected the $205 price. So today I called Comcast and asked the first agent I spoke to if I could talk to the retention department. I explained to the retention department that I was exploring options for reducing the cost of my service, and was considering going to a lower-priced package or going to a different service provider. The guy asked me a few questions about my use of Comcast’s cable, internet and phone service. Then he said being that I’m a long-time customer, he could offer me a promotion where I could keep the same package I currently have for a price of $160/month, which would increase to $180/month after 1 year, then increase to the regular price (currently $205) after that. I asked if there were termination fees and he said not with that deal, but he said if I wanted the $160 price for two years, I would have to agree to a contract with a certain termination fee – that deal goes up to $180 for the 3rd year, and then to the regular price after that. I basically jumped at that deal. A savings of $45/month for the next two years = $1080!! Plus another $25/month savings for another year after that! It’s still overpriced, but at least I get some savings over what I could be paying. Regardless I’m very happy with what I got. Thanks again! Awesome! Thanks for sharing your success with us! I had something like this happen to my roommate and I several years ago with Comcast. What they told us, however, was that they weren’t going to honor the “12 months promotional period” we had signed up for because they could change their mind at any time (after only 6 months apparently). My roommate called them and proceeded to have what I consider the most hilarious conversation with a customer rep that I’ve ever heard. The customer rep we got refused to transfer him to the retention department and by the end of the phone call, my roommate started saying “just say you don’t want me as a customer anymore” which the rep actually did say. Needless to say, we cancelled that service on the spot. Honestly, I refuse to use Comcast and highly suggest everyone else avoid them. My wife had a problem when she cancelled her service where they sent her account to collections because they wouldn’t send a written copy of the bill. They told her “Just pay us what we say is due and we’ll send you any overage back when we figure it all out”. She called them every day and they refused to send her a paper bill. When she explained that to the collection agency, it was amazing how quickly they were willing to figure out that whole “what you actually owe” thing and it was a couple hundred of dollars less than what they told her she owed. Wow – crazy stories! I know Comcast is trying hard to alleviate their “worst company in America” status – but they probably still have a ways to go.